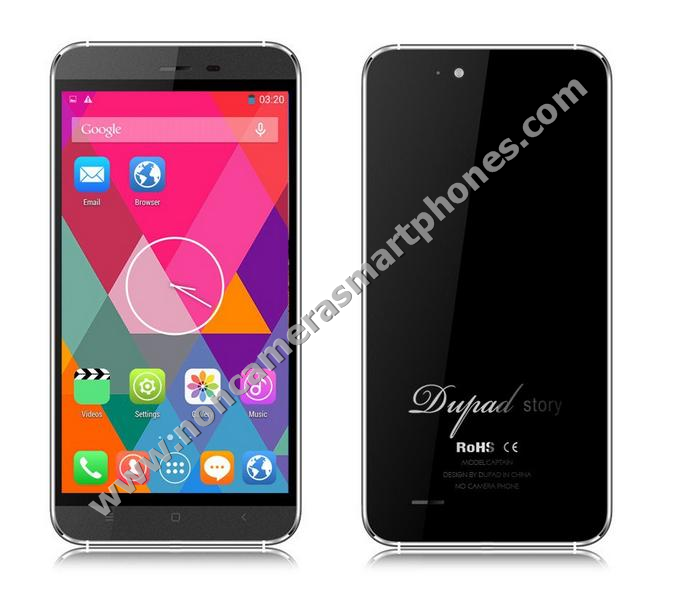 Dupad Story Captain non camera smartphone with GPS facility comes with 5.5 inch IPS HD multi point capacitive touch screen and IP65 waterproof feature. The IPS screen supports a resolution up to 1280 x 720 pixels with dragontrail display having environmental friendly aluminium silicon glass which is lighter, thinner, anti-scratch, more rugged fine quality glass. The no camera 3G android smartphone supports Dual SIM Card Dual Standby feature with built-in GPS facility. The cameraless smartphone physical dimensions are 7.3 mm x 76.8 mm x 154.1 mm. The dual sim cameraless phablet smartphone has 16 GB of internal phone memory storage with 2 GB RAM and supports external microSD card upto 64 GB. The cameraless smartphone runs on 2G frequency of GSM 850 / 900 / 1800 / 1900 MHz and 3G frequency of WCDMA 850 / 1900 / 2100 MHz. The OTG function can quickly connect with U disk, card read machine, mp3, keyboard, camera bringing you a finest experience. The Phablet supports GPRS, EDGE, Wlan Wi-Fi 802.11 a,b,g,n,ac, Bluetooth, GPS, microUSB, 3.5mm audio jack, FM radio, loudspeaker and multiple languages. This without camera smartphone supports WhatsApp and other instant messaging chat appplications and same can be checked in google play store app and installed. The phone comes in white , grey color. The box packed contents include Phone, Headset, battery, USB cable and user manual Quick start guide. Share this phone details online using below social networking bookmark buttons.